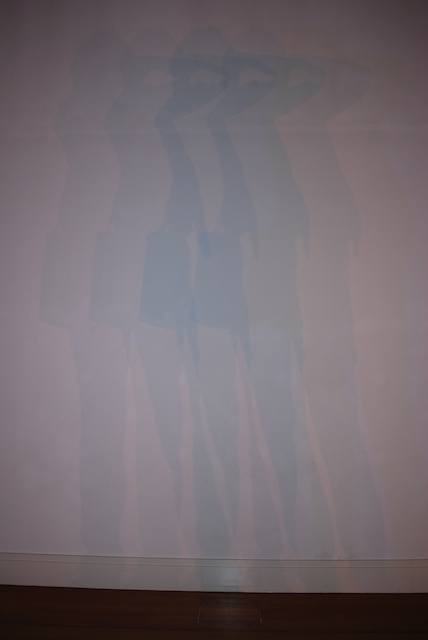 Today I went to see the first solo exhibition in Berlin, Innen Stadt Aussen (Inside City Outside), by the Danish-Icelandic artist Olafur Eliasson (who has been a resident of Berlin for many years). I can’t recommend this exhibition highly enough – if you are anywhere near Berlin, you should definitely go to see it. It’s at the Martin Gropius Bau, which is a powerhouse of a museum, showing major blockbuster exhibitions: at the moment, the crowd-puller is a huge Frida Kahlo exhibition. When we arrived, people were queuing to buy tickets, then queuing again to enter one level of the musuem, then queuing again to get into the exhibition. 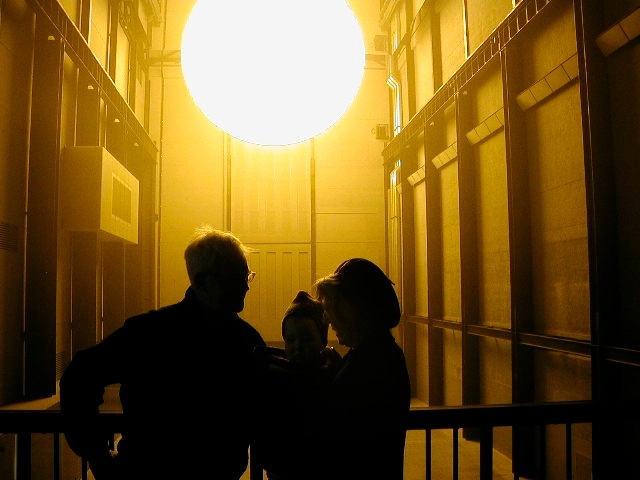 We were always intending to go to the Eliasson exhibition, but the sight of so many people simply existing in a kind of suspended animation, made me doubly glad that we had decided just to go to the one show. And the show… it’s really quite hard to describe, because it had such an impact on me. It’s the sort of experience that I think I will remember for many, many years to come. …and he builds sculptures of silver metal which contain cleverly placed lights and mirrors so that when one peeps into the internal cavities it appears that there is no floor, with the sculpture falling away to nothing before one’s feet. 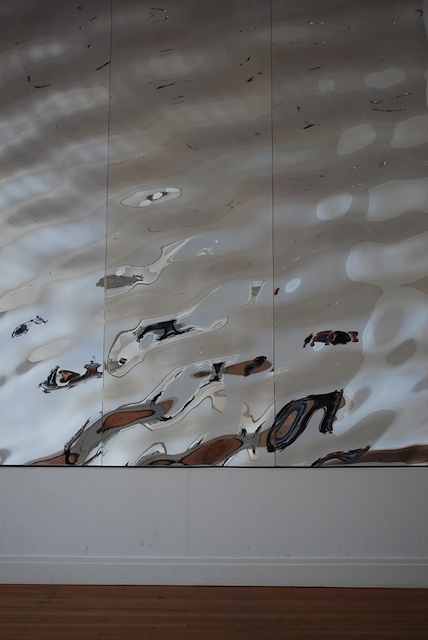 There’s also a fascinating piece of moving-image art, a short film made around various locations (such as Moritzplatz and Kortbusser Tor) in Berlin, using a mirror to generate a sense of liquidity and shiver in the density of urban locations. But in addition to these, there are two absolutely show-stopping artworks. In one, you enter a space that is constructed entirely of angled glass. It is a narrow space, an inverted triangle, but the mirrors make it appear to open to infinity on all sides, so that one fears to approach its edges, which initially seem to fall away, but then tilt to reveal another floor on which one is reflected, standing firmly and looking back into the main space. Sadly, this room was populated with museum staff whose main aim seemed to be to stop people taking pictures, and so I can’t show you what this amazing room looked like in any way. It seemed like this might have been the highlight of the exhibition, until we entered another room, which was taped off, and which had a warning notice on the door stating that only children over six years old could enter…. This space inside this room was as hot as a sauna, and initially appeared to be filled with steam. (Although i know I should be fearless in my experience of art, I’m ashamed to report that my first thought was ‘oh no, my hair will go frizzy…’.) But the steam was actually smoke (and so, my hair survived, un-frizzed). 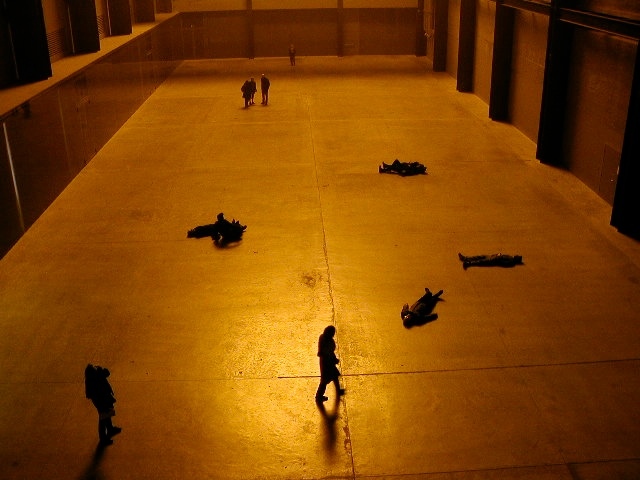 The room was filled with smoke, which was coloured by long narrow lights in the ceiling, segmented by barriers, which shone down into the space. 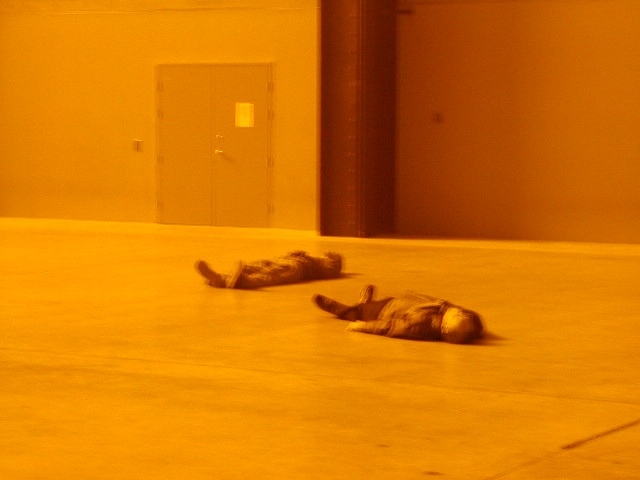 The lights in the ceiling were ordered according to the spectrum, so that the smoke in the room was in effect dyed according to the colour of the lights above. The dense smoke in the room meant that you could see only as far ahead as an arm’s length, meaning that all depth of field was lost, and you moved through the spectrum of colour, from one to the next, with no horizon, and no sense of boundary, horizon or limit. It was utterly disorienting and completely transporting. You were literally walking in colour. At one point, in the red-to-violet section of the spectrum, the colour was so intense that my eyes could hardly make sense of what they were seeing. And so we stumbled around, joyfully, for quite some time, until we admitted it was time to leave (well, it was as hot as a sauna – maybe it is designed to be hot so that people don’t stay in there for hours). And we emerged from the room and into the body of the museum (where people were still queuing hopelessly for the Kahlo exhibition), blissed out on colour. 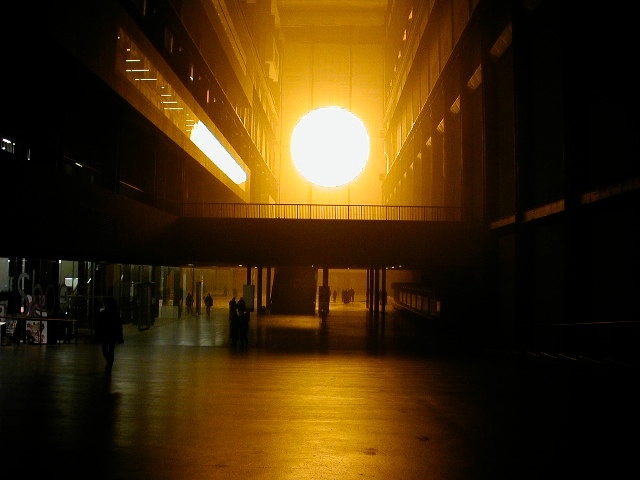 I’ll always be grateful to Eliasson for this experience. A thoughtful, thought-provoking exhibition, capped with a mind-blowing artwork which takes on some of the limits of the relationship between artwork and spectator and dissolves them into coloured smoke. I’m in Berlin for a few weeks, doing some research on street art here (about which more later, no doubt). But Berlin is not only a city filled with uncommissioned art, it is also a city immersed in the work of memorialisation of the past through public art and sculpture. 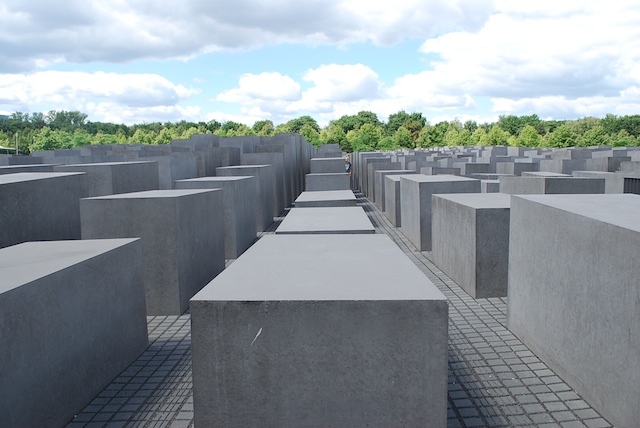 This is very much one of my interests – how a city represents its relation to events which have marked its identity and character – and so on Wednesday, I went to see the Memorial to the Murdered Jews of Europe. This massive memorial site is located in the heart of Berlin, one block from the Brandenburg Gate, two blocks from the Reichstag, across the road from the US Embassy, close to Potsdamer Platz, and so on. Locating the memorial here (rather than in, say, some out of the way park, as might easily have been done) thus embeds it within the centre of Berlin as a seat of government, as an international city, and as a tourist destination. 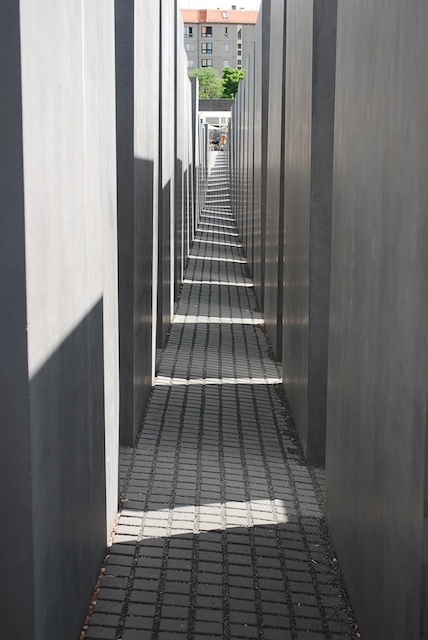 The memorial, designed by architect Peter Eisenman and engineer Buro Happold, occupies a site that is pretty much the size of a city block (4.7 acres, in fact), and consists of 2,711 dark grey stelae (stone blocks) of various heights, arranged in rows, but patterned in that they appear to undulate across the site. This undulation is created partly by the varying heights of the stelae, and partly by the fact that they stand upon ground which rises and falls, rolling across the site in paved peaks and troughs (something that is hard to see from the outside, and which is instead experienced as you walk into it). It’s an important part of the design that this is a memorial that you enter, rather than simply look at. 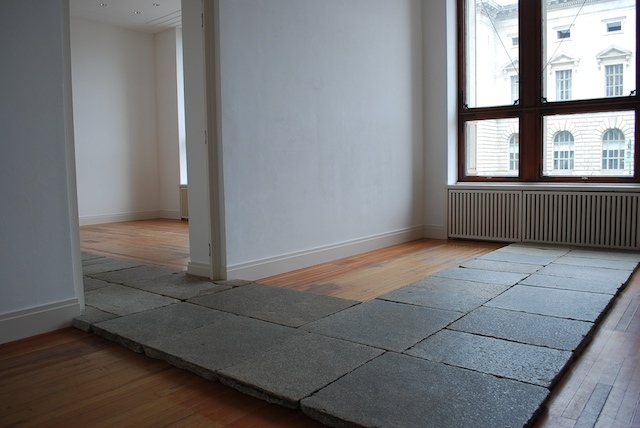 It is designed to offer a range of unmarked paths that can be traced through the grey blocks. At its sides, the stelae are relatively small – knee-high, looking more like seats than columns. But the undulating unevenness of the ground means that, as you enter the site, very quickly the ground falls away, and you are surrounded by higher and higher blocks of stone, until they fairly tower above you, reaching as much as fifteen feet in height. At these points, sound – from other visitors, from traffic on the nearby streets – is muffled, and there is a feeling of being, quite suddenly, cut off from the world. Thanks to the arrangement of the columns in blocks and rows, it’s possible to invent a path through what is revealed as a labyrinthine structure, in order to come out on the other side. Some paths are, literally, straightforward, marching in one direction across the site; others suddenly take you into a trough, in which the way through seems obscured. And, thanks to the presence of other visitors who can’t be seen until you almost collide with them as their path intersects with your own, any way that you choose may turn out to be momentarily impeded. 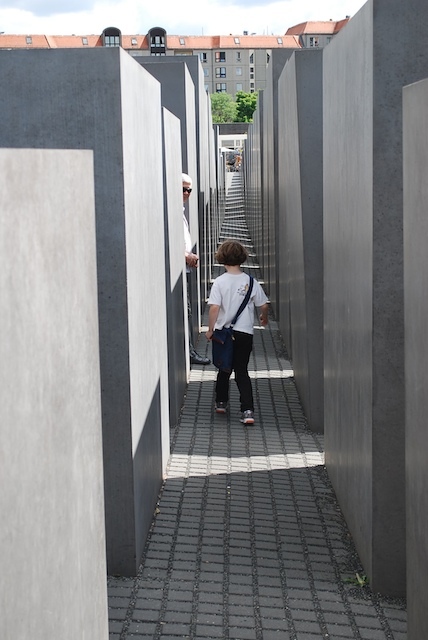 In this way, the memorial enacts a powerful narrative about the Shoah – the randomness of horrors, the ways in which escape routes chosen by individuals could turn out to be blocked by others, the suddenness with which people were isolated from assistance…. Before visiting, I had seen pictures of the memorial, and thus knew something of what to expect from it. But I hadn’t anticipated the experience of being at and in the memorial to be so effective (although note that I’m not saying ‘affective’ – and more about the memorial’s affect later). So what was it that was striking, in the experience of being there (as opposed to simply seeing pictures and reading about the memorial’s design)? I noticed immediately (and can vividly remember) the smoothness of the stone used for the grey stelae: to run your hands down the side of one constitutes a beautifully tactile experience. And I later recalled that there was controversy about the anti-graffiti coating that was applied to these stelae – the product originally used was made by a subsidiary company of the one that manufactured Zyklon B for the gas chambers. It seems unclear whether this was a slip-up in the memorial’s manufacture: perhaps some functionary sourced the coating without checking whether its manufacturer had any links to the Shoah, but perhaps instead it’s a means of provoking discussion about how many companies that were operating during – and profiting from – the Holocaust are still engaged in commerce today… But what can be said is that this is also one of the effective things about the memorial (smooth stone prompts one to think of the chemical coating the stone, and perhaps also its provenance and manufacture): its tactility directs thought in ways that words can’t quite manage. I also went into the visitor centre, located underneath the memorial. I’ve written elsewhere about Holocaust museums and visitor centres, and I have great scepticism about how some of them are constructed, but this one is well done. It engages the senses – rooms with visual timelines of events are matched by a room in which a voice reads out the name and a brief biography of each Jewish person lost in the Shoah (to read them all will take over six years). Most remarkable was a dimly lit room with lighted panels in the floor (rather than placed on a wall in standard museum format): the panels showed letters and postcards written by individuals in ghettos and on the trains to the camps (some of these thrown from the trains and salvaged by others). But most interesting of all for me in the days since seeing the memorial is the question of how there is no necessary affective relation between the architecture of this monument and the experience of being there. Its affect is contingent upon knowledge of what it is there for; its status is therefore nominal, in that solemnity and gravity depend upon its being named as the ‘Memorial to the Murdered Jews of Europe’. We didn’t burden her with any of the narrative that the memorial seeks to animate – and in fact I rather envied her the ability to experience the site in its purely physical form without its metaphorical overlay. Did her delighted leaping from one corridor to another have an impact upon my affective relation to the site? 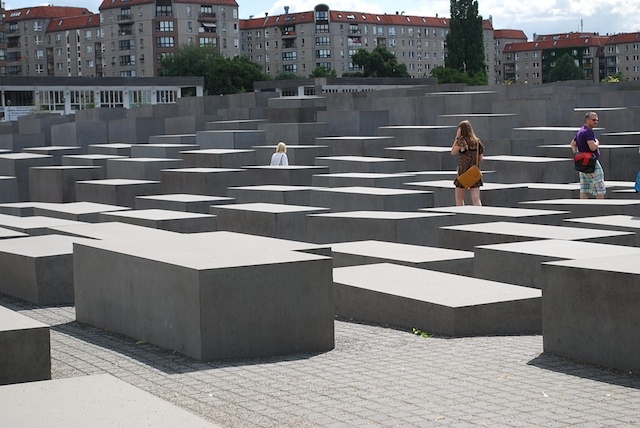 I certainly found it far less affective than some other Holocaust memorials that I have seen (for example, in Prague and Budapest, and also here in Berlin, on Grosse Hamburger Strasse). So what is the affective relation sought by this particular site? Perhaps it’s not that it failed to generate the solemnity and pensiveness that arises so easily at some other memorial locations, but perhaps instead its affectivity is mutable, intricate and elusive. At any rate, I’ve thought of it and about it many times since we visited a week ago, and in this respect – as a spur to thought – it performs an admirable function.